Most of us probably won't be swimming during Halloween. Perhaps you'll be lucky and have weather warm enough to have a Halloween pool party. Or you might be staying in a hotel that night! Either way, don't worry, these swimsuits won't need to be worn exclusively at Halloween. You can sport your Dia de los Muertos pride by wearing these Day of the Dead swimsuits at the next summer pool party you attend. I like how elegant this multicolor Day of the Dead swimsuit looks. It would be so cool to see this under a bunch of blacklights - the colors would just pop. You could wear this as the "top" for a party with a very puffed up skirt. I love the beautiful sugar skull makeup on this Day of the Dead swimsuit. The intricate designs will catch people's eyes as you waltz in to swim. It's alluring and very unsettling at the same time. 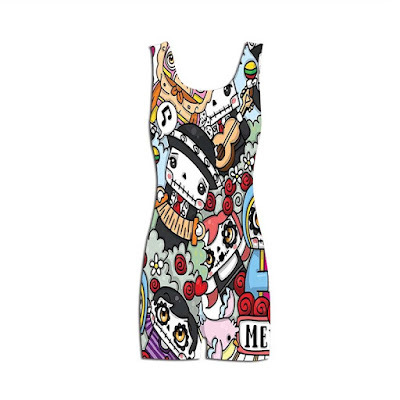 Don't let the adorable artwork on this Day of the Dead swimsuit fool you. These happy skeletons are still singing songs for the dead. This is a fun bathing suit for teens with a darker streak. 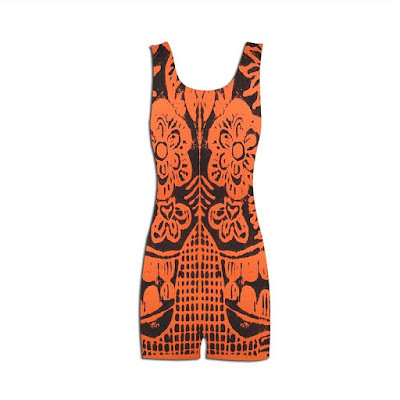 This Day of the Dead boyleg swimsuit has the same illustration as above. I love how they incorporate some of their traditions on this bathing suit like the musicians and sugar skulls. 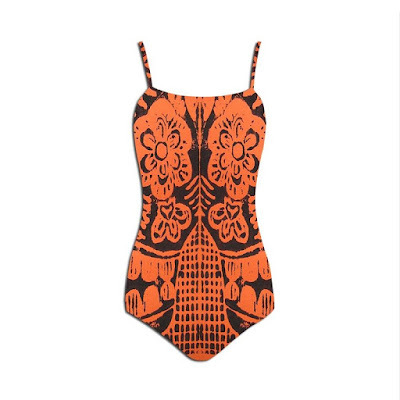 Isn't it cool that this Day of the Dead swimwear looks like an antique? I love the rustic looks of the orange and black - Perfect for Halloween! I think if you looked at the sides of this Day of the Dead swimwear you can see the sugar skull. That makes it all the more creepy, because you can feel its eyes watching you, but you can't see the skull without really searching for it! Maybe I'm just hungry, but the top of the sugar skull's hat looked like a cupcake to me. The Skull Day of the Dead swimsuit is actually quite creepy! I would feel a little disturbed if I was snorkeling and saw this guy staring right at me. All these designs in their own right are elegant and spooky. 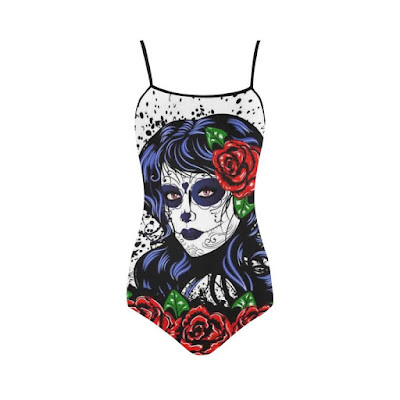 Take a look at more Day of the Dead swimsuits on Amazon. Which one is your favorite? Tell me about it down below!